This article is about hypothesis driven drug discovery. For Ashok Vaidya's clinical trial method, see Classical pharmacology § Application to Ayurvedic drugs. In the field of drug discovery, reverse pharmacology  also known as target-based drug discovery (TDD), a hypothesis is first made that modulation of the activity of a specific protein target will have beneficial therapeutic effects. Screening of chemical libraries of small molecules is then used to identify compounds that bind with high affinity to the target. The hits from these screens are then used as starting points for drug discovery. This method became popular after the sequencing of the human genome which allowed rapid cloning and synthesis of large quantities of purified proteins. This method is the most widely used in drug discovery today. 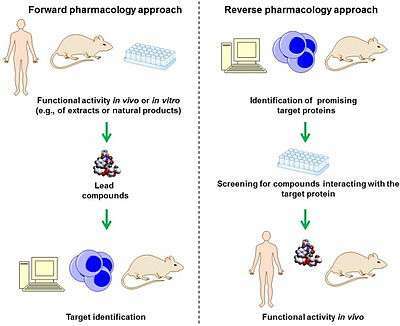 Differently than the classical (forward) pharmacology, with the reverse pharmacology approach in vivo efficacy of identified active (lead) compounds is usually performed in the final drug discovery stages. ↑ Takenaka T (Sep 2001). "Classical vs reverse pharmacology in drug discovery". BJU International. 88 Suppl 2: 7–10; discussion 49–50. doi:10.1111/j.1464-410X.2001.00112.x. PMID 11589663. ↑ Lazo JS (Apr 2008). "Rear-view mirrors and crystal balls: a brief reflection on drug discovery". Molecular Interventions. 8 (2): 60–3. doi:10.1124/mi.8.2.1. PMID 18403648. ↑ Lee JA, Uhlik MT, Moxham CM, Tomandl D, Sall DJ (May 2012). "Modern phenotypic drug discovery is a viable, neoclassic pharma strategy". Journal of Medicinal Chemistry. 55 (10): 4527–38. doi:10.1021/jm201649s. PMID 22409666. ↑ Swinney DC, Anthony J (Jul 2011). "How were new medicines discovered?". Nature Reviews. Drug Discovery. 10 (7): 507–19. doi:10.1038/nrd3480. PMID 21701501.